Chiropractic care, the manipulation of the body’s joints, helps improve areas of the body with limited or restricted movement. A chiropractor will focus on the musculoskeletal and nervous system and how associated disorders can affect the overall health of the body. At LIV Integrative Health, we offer family chiropractic care, and we pride ourselves on our gentle adjustments. We also utilize the activator or drop table techniques on those who are not comfortable with manual manipulation. Chiropractic care is an excellent means of pain relief, relief of tight muscles and ligaments, muscle knots, and trigger points. The Doctors of Chiropractic will diagnose and treat underlying causes of your aches and pains, without the use of unnecessary drugs and surgery. Stretches, exercises, therapies, and chiropractic manipulation are utilized to help restore your health. We have state of the art equipment to get you feeling better, faster! The purpose of your chiropractic care here at our integrative medicine clinic is to reduce stress, promote proper alignment, improve immune functions, and relieve pain. When combined with our complementary and alternative medicine approach, patients are able to optimize their fortitude and set the foundation for a lifetime of health. Our Doctors of Chiropractic have the experience and training needed to provide outstanding results with a personalized care plan for each and every patient. Whether you’re recovering from a sports injury or are suffering from a lifetime of bad posture, our chiropractors are here to help. Back Pain Relief. Sciatica treatments are a common practice in this country, and our Newport Beach integrative medical center aims to provide the best relief for sciatica-related symptoms. Hypertension Assistance. Medical studies have revealed that professional chiropractic care can help greatly in lowering blood pressure. In 2007, a team released data that showed that one chiropractic adjustment was as effective as two pills that are used to lower blood pressure. These researchers even found that one adjustment was effective enough to reduce issues for six months! Headaches and Migraines. One common reason that patients visit our integrative wellness center is to relieve migraine and tension headaches. Fortunately, our healthcare professionals have seen great success in treating, resolving, and preventing headaches for our satisfied patients. Our chiropractic practice works hard to ensure that you will not have to rely on strong medications for relief. Neck Pain. From pinched nerves to posture problems, neck pain can be a debilitating problem for many Californians. Our integrative medicine experts will be able to provide quality chiropractic treatment to treat neck pain with a very high satisfaction rate. Neurological Issues. Our chiropractic neurologists will be able to offer treatment for your nerves, spinal cord, and brain. LIV Integrative Health strives to provide comprehensive care, which is why this specialty focuses on increasing blood and spinal fluid circulation. Our chiropractic care works to prevent future issues by combatting problems at the source, including issues such as vertebral subluxation. Scoliosis. Combining your chiropractic care with other physical therapy techniques have been proven to promote healthy management in order to prevent pain and future surgery. Our team will work together to formulate a plan to help manage your scoliosis. Sports Benefits. The increase in functionality and flexibility has helped to make quality chiropractic treatments a popular service in the professional sports world. Whether you’re hoping to relieve muscle tension or improve blood flow, our care professionals are here to assist. These benefits are only possible if you find a trained, experienced chiropractor with a history of success. Our integrative medical professionals strive to provide the best care for our patients in a way that promotes healthy living for the long haul. We’re here to get you healthy and help you stay that way. Be sure to reach out to LIV Integrative Health to schedule your appointment! The Class IV laser is a deep tissue laser that uses deep, penetrating, photonic light energy to relieve aches, pains and stiffness by increasing microcirculation and reducing inflammation. Laser therapy helps your body use its own natural healing powers by stimulating a positive cellular response and increasing oxygenation. The Triton DTS Traction Unit provides clinically proven pain treatment that gets to the root of cervical and lumbar pain. Spinal decompression stretches the spine to take pressure off the compressed discs. 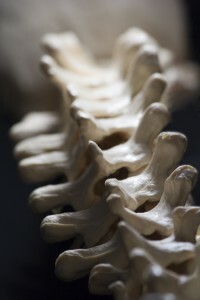 This straightens the spine and improves the body’s ability to heal itself.